An award-winning spa retreat, for anyone who craves those true luxuries, peace & privacy. Set on a 150-acre wooded estate overlooking a serene lake, the Champneys Forest Mere offers a tranquil, secluded atmosphere. With 89 guest rooms, and catering to guests looking to combine rejuvenation and relaxation in England's south coastal countryside. Guests can indulge in an array of beauty and holistic therapies, including the signature Rasul mud ritual, followed by a dip in the thalassotherapy pool, the first in the U.K. Additional on-site amenities include indoor and outdoor swimming pools, a tennis court, alternative health clinic, and various fitness classes ranging from high energy to meditative. Only nutritious cuisine is served at the resort restaurant. The 200-square-meter spa has 43 treatment rooms and boasts the U.K.'s first thalassotherapy pool. Additional spa facilities include a sauna, steam room, mud treatment areas, and separate men's and women's locker rooms. The spa menu blends holistic and beauty treatments such as reflexology, shiatsu, facials, and microdermabrasion using Champneys, Elemis, Babor, and Bare Escentuals products. Additional offerings include invigorating salt and citrus scrubs, slimming and firming wraps, and nail, waxing, hair, and makeup services; guests can also unwind with palmistry, hypnotherapy, and numerology therapies at the Alternative Health Clinic. The spa's Rasul chamber, in which guests can apply purifying muds while basking in therapeutic steam, is a popular fixture for individuals and couples. Guests can also relax with a dip in the 25-meter indoor swimming pool, followed by a refreshing, healthy drink at the Spa Bar. 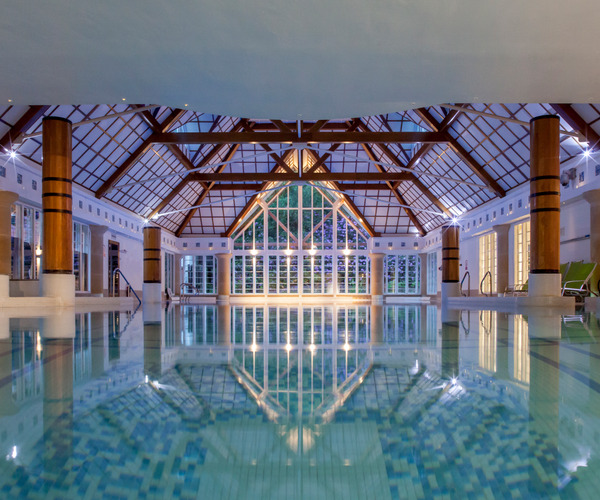 Champneys Forest Mere offers a wide range of activities designed to enhance guests' overall physical and spiritual well-being. The on-site gym features Cybex and Vibrogym equipment and guests can choose from a selection of exercise classes, including aerobics, circuit training, tai chi and yoga, in the two fitness studios. Personal training is also offered. Guests can perfect their swing with a tennis match or lesson on the outdoor hard court or cast a line trout fishing in the property's lake. Indoor and outdoor swimming pools are available, and golf and horseback riding are available a short distance from the resort. Champneys Forest Mere is conveniently located near the popular cities of Guildford, Portsmouth, and Southampton. The cathedral city of Chichester, located in West Sussex, is also worth a trip for its 11th-century cathedral, summer arts and music festival, harbour, and galleries. The 87 guest accommodations range from Economy Rooms, appointed with a bath or shower, to spacious Suites, individually styled and furnished. Amenities such as bathrobes, refreshment trays, colour TVs, and in-house toiletries provide a restful, comfortable atmosphere. Some rooms provide balconies or patios. Menus from the resort's three dining establishments highlight nutritious yet flavourful cuisine and provide a balanced diet. Dishes are high in fibre and low in saturated fats, sugar, and salt, and are prepared with fresh, locally sourced ingredients. The dining ambience is casual, guests are encouraged to wear robes to breakfast and lunch (proper attire is requested for dinner) and a common table invites guests to interact. Spa restaurant serves breakfast, lunch, and dinner, as well as snacks and refreshments throughout the day, while Terrace restaurant offers guests alfresco dining on its patio overlooking the lake. Mere restaurant, the resort's fine dining establishment for Premier guests, offers five-course dinners with a complimentary glass of wine. Vegan and vegetarian diets can be accommodated, kosher diets can be catered for upon request for an additional cost (four days notice is required). Champneys also offers Food Sensitivity Screening that quickly detects food intolerances and vitamin and mineral deficiencies.